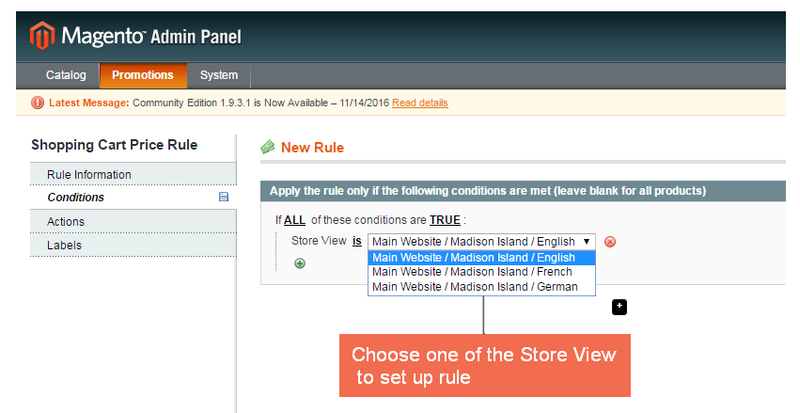 Magento® Shopping Cart Rules per Store View Extension allows admin to set up different shopping cart price rules for various store views to optimize promotion efficiency. 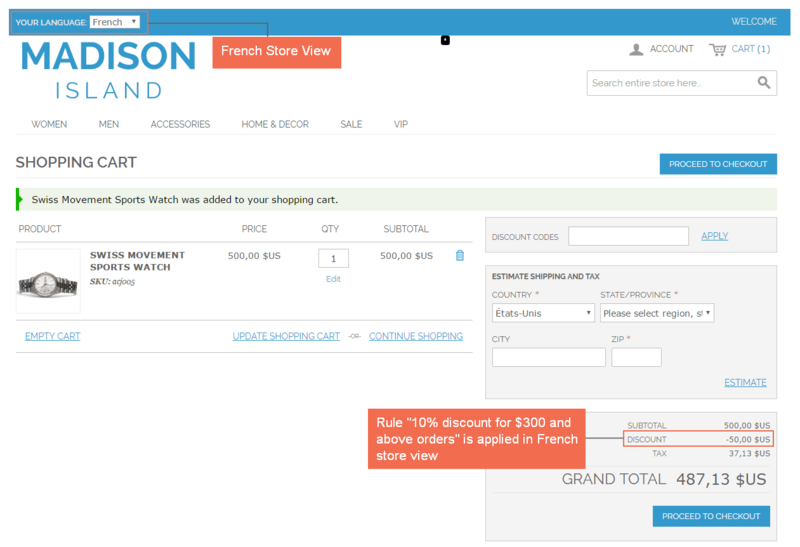 Magento supports creating multiple store views to show products in different languages for different countries. With this function, store owners can localize their trading for each target market. However, Magento default does not support store view pricing and shopping cart rules in each store view, so the purpose of multiple store views is not optimized. 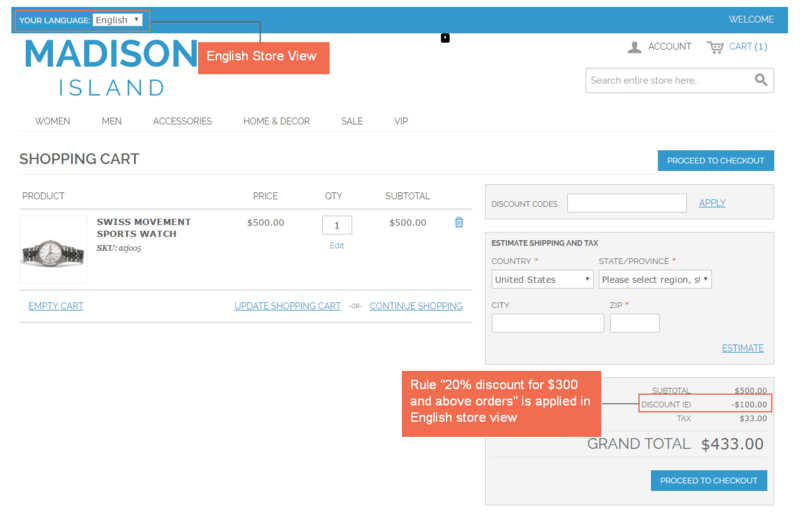 Magento® Shopping Cart Price Rule per Store View Extension is developed to help admin create different shopping cart rules for each store view to maximize the advantages brought by multiple store views. 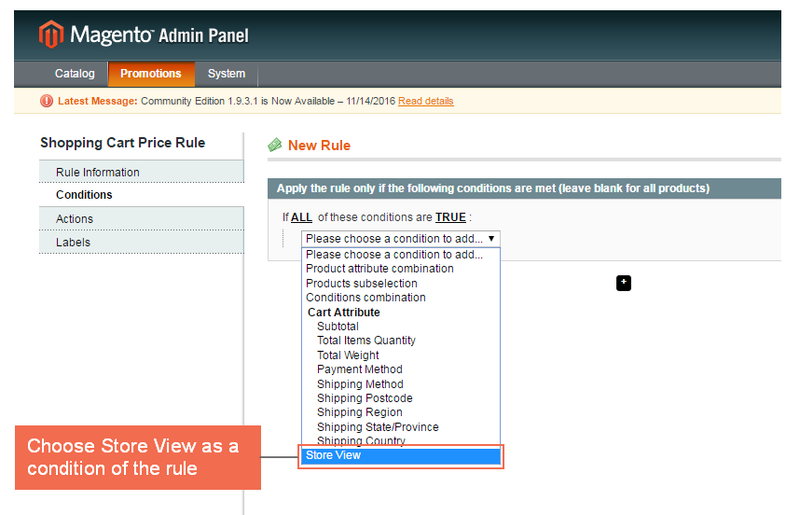 => Shopping Cart Price Rule per Store View for Magento 2 extension is available now! In default Magento, admins only can set up shopping cart price rules at website level. It means that a rule must be applied on the whole website. However, store owners may want to apply different price policies for different areas, so they have demand of creating separated rules for shopping cart in each store view. Magento® Shoppping Cart Price Rule per Store View Extension allows store owners to diversify promotion in each target market without trouble. Why Magento® Shopping Cart Price Rule per Store View by BSSCommerce is your must-have extension? Each store view is created for different customer groups mostly based on geographical variety. There is a fact that each area is not only differ from location but also interest, buying habit, buying power… So, it is essential to have different rules that are suitable for each area. Promotions now can be set up to adapt each kind of customers depending on their countries. It is convenient for store owners when planning and conducting promotion campaigns because they can easily set up different rules for separated target customers. With this extension, admins can manage their shops more effectively with various choices to set up price. Besides, promotion campaigns targeted to right customers will boost up sale and revenue as well. I have been using this extension for 4 months and really like all of its features that benefit for my store. Because it has some store views, running promotions becomes more conveniently thanks to BSS module. BSS support team is also extremely enthusiastic! Thanks to this great extension, I can easily run my particular promotion for local market. I also highly appreciate amazing support from BSS team. All guys are doing very well. Keep on moving towards! The installation of this extension is so easy. It works perfectly, too. The most unique in this extension is that it can set rules for different store view. I have never seen other extension do such thing. setting rules in magento is quite tricky but with the help of support team I can fully understand how to do it. Great extension guys! The best extension I have been using! Nothing to say more about this module because it is extremely awesome and useful for my store. It overcomes one of Magento drawback that I always want to apply for my site. Therefore, buying this module is the true decision and I can easily set up shopping cart price rule for store views. Why in Multiple store views are different prices set for same products?